I have been messaged many times over the course of my playing asking how did I improve so fast or have been questioned about my legitimacy. So I have decided to make a guide that will cover what I have done to improve. This saves me having to message everyone individually with paragraphs after paragraphs. The guide will cover my experiences as a 6 digit player all the way to 3 digits, firstly introducing the basics of improving with general explanations. Later in the guide will be more specific methods to improving, beatmaps to play and practicing routines which I find helpful and effective to improving faster. DISCLAIMER: This guide is aimed at people who are willing to work extremely hard, doing warm ups/exercises for over an hour before actually playing anything for pp/high scores. We’re talking sweaty butts, sweaty fingers and burning forearms/fingers. Keep in mind the points mentioned in this guide are MY RECOMMENDATIONS. This is how I played and and you may not be the same (preference and motivation-wise). Use this guide to give you an idea of what it can achieve. There’s really no way to get better other than to practice. The problem is people say “just play more” which doesn’t distinguish between good practice and bad practice. Consistency, routines and strategies increase the efficiency of a practice session. I absolutely hate it when I ask for advice and someone replies with “play more”… PLAY MORE WHAT? I’m sure you’ve experienced this before and end up without an answer in the end. That’s why I have decided to make something which will both explain what I did and help others in the process. Step 1 of the journey for me was simply playing the game to get used to it. 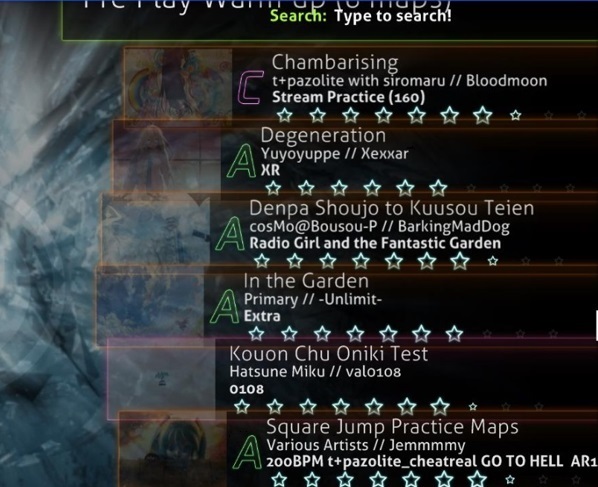 I didn’t play any mods until around 4.5k pp. At this point I was making plays around 200pp or a little more. Depending on your current level, this might be low or really high. My advice for getting to this “Oh I’m making 200pp plays and no mod is starting to be tricky to get more pp” is to play based on star rating difficulty. When I first knew pp existed and there was a ranking system, I was at 999pp. I had no idea what the number meant and always played with No Fail on, not knowing that this reduces pp by 10%, but tried to get to 1000pp thinking something would happen. Not knowing the system, I just played songs and eventually it went to 1000pp. Anyways, what I’m getting at is I started playing songs at around 2-3 stars and pp didn’t matter. I simply used the star difficulty to determine my progress up till around 5.2 stars without being overly concerned about how much pp a song gave. I recommend aiming for FCs at your comfortable star difficulty. You will find that over time if you play at a star difficulty you are comfortable with and able to play consistently, your average star difficulty plays will slowly rise. I recommend ignoring the 6+ songs if you cannot at least play 4maps. My reasoning for this is because I feel it’s not productive practice. Of course, I’ve played these songs for fun which is fine but don’t try playing them seriously expecting anything big. So currently, rank-wise we are looking at around being a 6 digit player between 100k-300k. You don’t need a tablet or mechanical keyboard to play through these ranks. All that you should focus on is accuracy at this point. If you can get good accuracy when you start, you can build good habits which will pay off massively down the road. 98%+ accuracy is a great starting point. Don’t focus on trying to SS everything here, it’s irrelevant. Low star songs have a lower Overall Difficulty (OD) and Approach Rate (AR) which are very different to higher difficulties. I’m not going to discuss methods of improving in the early stages because that’s simply a matter of understanding the game mechanics and how to play properly. Therefore, I’ll skip a few steps to where you start wanting to learn how to get faster at tapping, streaming, improving your reading, jumps and overall control. So hopefully you’ve gotten to here as a player who has a keen interest in rapid performance. I have both a tablet and a mechanical keyboard. These were both key tools that helped me improve. It is by no means the only tools to use when practicing the following strategies but they are very helpful for the exercises discussed in this guide. AR 9: Where most songs are played no mod. I do not recommend playing AR 10 until you are comfortable with AR 9. This is because most no mod songs on their highest difficulty use AR 9. Don’t neglect it thinking “Oh, but I can play AR 10”. Consistency is huge in this game. There are so many aspects to master and knowing them all will make a much stronger and well-balanced player. If you can’t read AR 9, there is no secret to this; you either aren’t at a level to play songs that introduce AR 9 or haven’t familiarized yourself with this. Start playing those 4-5* maps that use AR 9. OD 8 and higher: At a lower level you will get used to playing OD 7. Once you play OD 8 you will definitely notice the change in timing required to prevent any 100s or 50s. It is very difficult for me to implement any strategies to improve timing. Basically, all your skills playing no mod should be consolidated by practicing. A general tip is to put a little more focus into the song through listening rather than reading. If you’re comfortable with AR 9 at this point you should try to play to the beat of the song instead of the approach circle. As a drummer, learning consistency in timing is essential. This allowed for timing to be innate for me before I started playing Osu!. This is something that is built over time without shortcuts. NEVER use Auto-Pilot mode for practicing timing. It causes bad coordination because normally, you play with the cursor in mind. If you disregard cursor coordination, you’re setting yourself up for bad habits. Improving aim and jumps: Once again, this is something that cannot be taught. All I can recommend is using a tablet area that you are comfortable with, and familiarizing yourself with it as much as possible. If you find that you are missing notes due to imbalance between the timing of your tap and your cursor movement, try to keep your eyes on the note until the very last moment where you have hit it. This may feel weird if you haven’t done this before, making your eyes strain a bit more. Over time, this will break the habit of leaving the note too early with your cursor and eventually your coordination between your tap and movement will become natural to the point where you don’t need to actively think about eyeing down notes. The best map for aim practice in my opinion is the square jump maps: Square Jump Practice Maps – All Difficulties: 149 (AR 8 & 9), 162.5 (AR 9 and 10), 180 (AR 9 and 10) & 200 bpm (AR 9 and 10). Before practicing anything, always play a pre-warm up set-list. This is to stimulate all aspects of the game such as streams, aim and reading. I never start my osu! sessions unless I pass all my pre-warm up songs (exceptions for really hard songs that I cannot pass regardless of if I’m playing well or not — Try not to add these into your pre-warm up collection unless you feel the song is really helpful for warming you up). My first pre-warm collection I made: 1. Stream Practice Maps – 150 bpm. This would warm my fingers up for standard play. 2. Square Jump Practice Maps – 180 bpm. Play either AR 9 or AR 10 (depending on which one you can do). This would warm up my aim and reading. 3. Maid-chan Yori – rollpan’s Extra. This would combine the warm ups done previously into a song that is slightly harder, faster and more demanding. I finish with Denpa Shoujo to Kuusou Teien as it’s the hardest song in my collection, combining everything that I just did. And yes, I have 6 pre-warm up songs now. Don’t limit it to three maps. Make sure to include all aspects of the game. The more practice the better. Your set-list does not have to be these songs but I highly recommend a long stream map at a low bpm followed with a slightly higher bpm song that requires aim and reading followed by a “final boss” song. After this you’re free to practice what you want to improve as you can start without feeling like you’re not ready. YOU ARE HERE TO LEARN HARD ROCK, NOT HIDDEN. PLAY WITHOUT HIDDEN WHEN LEARNING HARD ROCK. Make a “Hard Rock” Collection and add a variety of songs that you have FCed in the past (make sure they are AR 10). You only get 3 chances to play the song. If you fail 3 times, move on to the next song and play it. Rinse and Repeat. However, if you pass the song within 3 attempts, mark that song into a new Collection (for example “Hard Rock Passed”). Add that song into that list and come back to it another time. Keep playing the songs in your “Hard Rock” collection trying to pass as many as you can within the 3-strike limit. Note: Do not go back to playing the same song another 3 times unless a few hours have passed. After you have passed the song in your “Hard Rock Passed” a total of 3 times, move it into a new collection call “Hard Rock Consistent”. Again come back to these songs, but only give yourself ONE chance to pass. If you don’t pass, knock it back down into the “Hard Rock Passed” Collection. Your aim for the “Hard Rock Consistent” Collection is to aim for an FC. If you manage to FC it, add it to a “Hard Rock FC” Collection. Give yourself one chance for a 99%+ FC on the song. At this point, if you miss don’t worry about knocking it back down a collection. Simply play another song and come back to the song you were trying to FC later. Over time you will be able to visually see your results. Look back on your history of plays in your Local scores and look for the increasing performance that will appear for that song. OD 10: You have 19.5 milliseconds before and after the note to get a 300 on your hit. Timing for Hard Rock is built upon the timing you built before you played mods. This is why it’s important to consolidate your timing as you go on. Good timing means good accuracy and when you get to playing Hard Rock high accuracy is desired. As mentioned earlier, focus on listening when first learning Hard Rock. This is why Hard Rock is hard to learn. You need to keep in mind the Approach Rate while timing it correctly. Stick to it and you will see some great Unstable Rates and Accuracy. I did the above starting on songs around 5 stars (after applying Hard Rock) trying desperately to be able to do it. I did this for about 2 weeks straight, with about 80% of my play time dedicated to it. Over time i started to familiarize myself with it and it led to getting better at playing Hard Rock. Consistency is key. Play the Long Stream Practice Maps at 150 bpm. Your objective is to FC the song. Accuracy isn’t important at first but if you manage to get 97-100% on a play, you can move up to the next speed. The duration of these songs are anywhere from 2 minutes to 4 minutes and so you’re expected to hold these for insane lengths of time. This is why you start at a low bpm. I’m sure you’ve played a high bpm song before only to find that your fingers lock up and don’t move properly. This can be combated with playing these maps at low bpm. Work on fluid movement when you alternate between each finger. You WILL lock up eventually and your fingers will spasm, losing that sweet balance your fingers had on the first 10 notes. As soon as you finished the song or fail it, immediately restart and play it again. Don’t break. You want to aim for 5 play-throughs back to back. Now you earned your break. Break for 5 minutes and come back and play through it 5 times again. Repeat this process for a total of 3 times (or as long you want depending on how much time you have and how you feel — make sure you stop if you feel irregular pain though). This does not mean that during this time you cannot change bpm. For example, if you manage to FC the 150 bpm song by your 2nd play-through after the 1st break (7th play-through overall), move on to the 160 bpm song. Now you will feel that struggle again. Fun, isn’t it? If you do this every day, you will once again be able to look at your local scores and note that your accuracy increases with time. If you are struggling with an increased bpm after a while, feel free to step down to a lower bpm or stop practicing your streams for the day. As stated earlier, try to FC with good accuracy before you move on. We’re trying to build speed AND control. You will find that if you are able to hold 160 bpm for 2 minutes you’ll be able to then play short 170 or 180 bpm bursts much cleaner. This goes for all speeds as you improve. This is why it’s important to consolidate low bpm control; it allows for higher bpm short burst control. Every now and then, go test your progress on Osu! ~ Deathstream Compilation – Marathon. If you get further and further, you’re improving. I have also listed songs that are extremely difficult and not expected to be able to be played if you cannot stream well. I am also still trying to play these well. They are here for the future you to play. I can only give you tips up to where I have gotten to and what I did to get there. To give you an idea of how long this will take to increase, I started playing Long Stream Practice Maps at 150bpm in March 2016 and get halfway on the Long Stream Practice Maps 2 200 bpm map before completely losing stamina and control of my movement in August 2016. NOTE: It is not advised to try and play anything fast after completing this routine. Your fingers will be quite drained even after regaining stamina and won’t move correctly. Play slowly after this to prevent fatigued play. However, after doing this, there has been one time where I had infinite stamina, trying to FC the 160bpm map only to find that after a while I could go to 180bpm and play it endlessly when in the start of that session I couldnt even pass it. If this happens to you, take advantage of it. It’s rare and I have only experienced it once. I am a relatively slow player when it comes to speed so learning Double Time was challenging. When I started playing DT anything over 200 bpm was fast for me. Playing DT is the best way to become faster. Almost everything you play will be high bpm and high AR, forcing you to keep up. Playing Double Time opens the potential to “single tap practice” which I will discuss in the next section. It’s clear that lower AR songs have lower bpm and should be practised first. Also keep in mind, these songs are not 100pp plays when FC’ed. Theyre 200+. This goes to show how much you should practise the basics before actually attempting mods. You’re not going to improve quickly playing Double Time if you don’t try to play AR 8 and AR 9 songs. These songs usually are harder because as AR goes up, OD generally does too. Learning DT is not easy. I started with Hard Rock before playing Double Time. This was so that when I played AR 8 DT songs, the Approach Rate would be 9.67, which is less than Hard Rock at AR 10. This makes playing DT less demanding as you’re not required to tackle both a new approach rate speed and bpm speed. There is no strategy that I use for learning DT. The hard parts have been learnt already. If you delved into learning Hard Rock, starting DT is easy. Why? Because you can already play AR 10 and have been doing stream practice to give you the endurance required for higher bpm songs. Each aspect of training complements another. This is why it’s important to learn to do everything. If you can comfortably play DT at 220 bpm, I recommend improving it through the single tap practice I use. Thanks to Dumii, I was motivated to increase my single tap speed for those insane 250+ bpm songs that seem almost impossible to hold stamina on. In fact, I only started this practice from mid-July to now. I don’t recommend this kind of practice until you are capable of playing DT on songs around 220 bpm. This “single tap practice” is dedicated to high bpm songs that are close to impossible to stream for long periods. My only advice for this section is to use these maps as a way of building single tap speeds along with quick triples and burst streams. This is the most physically involved practice that makes you really work as you use more of your arm. These maps should not be played with Hidden as you’re not here to practice reading. This is solely high-speed endurance training. All songs are AR 8. Maps used in order of practice: Pre-play once: Freedom – Another: 130 bpm (only single taps, do not use 2 fingers at all) 1. Be Starters! – Insane: 252 bpm 2. Melt 3M Mix – Insane: 128 bpm 3. Paradise Cage – Insane: 261 bpm 4. RAINBOW GIRL – Insane: 263 bpm 5. Yuujou Pop – Ai: 261 bpm Cycle through these 5 songs a few times until you’re satisfied with your performance. This is as much as I can offer for this section as it’s highly demanding and I am still working on my own speed with these songs. If you have no mod songs, try and knock the score down with an improved modded play using HD or DT. Eventually, you may not be satisfied with DT or HR plays and want some more pp out of the play. Hidden mod gives a great 8% bonus pp which is always going to be beneficial for those pp hungry players. Personally, I never learned Hidden mod on its own. Hidden is a mod which is self-explanatory and simply requires you to get comfortable with the type of reading required for it. Add it to your favourite songs that you are familiar with if you need a starting point. I always use Hidden in addition to Double Time or Hard Rock because to reach the top, the bonus Hidden pp is needed. If you’re having trouble and you’re unsure why, maybe consider changing your skin? My skin plays an integral part to my timing and reading. I was having trouble playing some DTHD songs and I changed skin. Instantly FC’ed the songs I had trouble with and haven’t changed skins since. Sometimes problems are not always physical. Sound and vision also play a massive part in this game. Don’t neglect them. When I was working on consistency I didn’t go for massive pp plays. I tried to make plays about 80% of my highest pp score. However, this will change eventually where that isn’t enough to get the ranks you desire, potentially slowing down pp progress. Don’t get irritated, you’re still improving regardless of what your rank says. Some people say “Oh DT is just pp farm”. These are the Hard Rock or no mod players. Other players say “Hard Rock is easiest pp ever”. These are the DT players. From my viewpoint, both DT and HR are important and really helpful as they DO improve your overall skill. My no mod is much better because of learning to play with mods. Before I played mods I thought to myself “I DON’T WANNA PLAY MODS BECAUSE I’M GOOD AT NO MOD!” That perspective has changed. Now, I ALWAYS consider my weakest skill and play it until I’m satisfied with my performance at it. Never let one aspect of your performance drop. Keep them level so you have a balanced increase in skill level. Also, I never try and play something that I know I can’t. It’s not good practice. For example, take a game where u need a certain level or gear to complete something. Without those levels or gear required, you probably aren’t going to progress much, if at all. This is the same in Osu!. Without the skill required to complete/FC a song, you won’t be able to. Play a bit of everything every day, but play to your strongest one that day when trying for big FCs. I think it’s important to track what you’re successfully progressing on and keeping structure in your training. If you have found a variety of songs you are good at and want to try and go for the FC, chuck it into a collection and have it there, ready to play it at any time after your warm-up. Also, making an FC folder is always nice to look back on when you are playing terribly, hehe. If it’s just not working out play something else. There will be days where you don’t play well at all, and some days where you don’t play well in certain aspects. Shift through the 4 categories I have written about: Stream practice, Hard Rock, Double Time or single tap practice. If you cant single tap because you can’t keep up, play HR. If you can’t aim or get high accuracy at high OD, play some lower bpm DT (considering you aren’t feeling in top condition for high bpm single taps). If you can’t do either HR or DT, just work on your streams. If you can’t play any of them, just don’t play (or go mess around on multiplayer). Not playing is sometimes vital as breaks help you improve too. I have had experiences where I stop playing for 3-4 days and come back feeling better than I did before. Breaks are necessary to give your brain a chance to process what you’ve just learned. Each aspect of play that you work on might take you about a week to be noticeable. Once you feel that little edge, play something you might FC or get additional pp on (i.e through improved accuracy/combo) and it usually comes. That’s it! You’re well on your way to becoming an Osu! Rhythm Champion! I hope my guide has motivated you to improve yourself or simply helped you get over certain hurdles.